I recently did a post on the 1933 Lee and, while doing so, I learned how it was redesigned in 1934 to be Hamilton's lowest priced model to date, at a mere $45. That was still a lot of money back then though and the equivalent of about $800 in today's dollars. 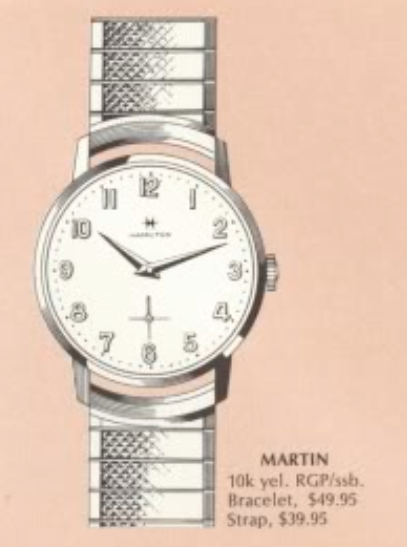 By 1965, or 30 years later, Hamilton offered watches at an even lower price point. For example the 1965 Martin retailed at just under $40, the equivalent of $300 today - or just $17 in 1934 dollars. The watch industry was under intense competitive pressure from global production of low cost, high quality time pieces. The Martin was produced for only a single year. It was the second model to be named Martin though, the earlier one having been produced a generation earlier, starting in 1941. To compete at such a low the price point, the Martin came in a 10K RGP case with a stainless steel back. The manual-winding movement is a Swiss-made Hamilton 686 grade, made by ETA. I recently picked up a project Martin in a favorite local shop of mine. It was in very rough shape with a serious case of "old man fink" and it was not running. I really hate these "one size fits all" expansion bracelets with spring loaded ends. The springs press the sharp edges of the bracelet ends up against the lugs and will eventually wear right into them. You can see that's been going on with this poor watch and I almost passed on the purchase because I feared the case would be shot. As suspected, the bracelet took it's toll on the lugs but I've seen a lot worse. There's verdigris peaking in around the crystal too - giving the crystal a green glow. Without the bezel in the way, you can see that the dial is in nice shape. It's a textured dial with small vertical grooves. Just a little excess verdigris leaked onto the outer edge but that will be easy to remove. There's no obvious reason for the watch not running. I assume it's probably just gummed up by old oil that has turned to gel. Everything is thoroughly cleaned and ready to be reassembled. Nothing appears to be broken so, hopefully, it will run just fine once I put it back together. Oddly enough, I could only get the watch to run for about 30 seconds before it petered out. After checking and re-checking everything, I eventually determined that the watch was not running due to having and incorrect stem installed. Go figure. If the wrong stem is installed, it could bind slightly provide just enough force inside the movement to rob the gear train of energy. The crown on the watch had an Omega symbol - so it's an obvious replacement. Since I have to fit a new stem, I decided to put a new crown on too. That's why the stem looks too long in the photo below of the now-running watch on my timer. I will trim it to length later. With the gear train free to convey the energy of the mainspring through to the balance, the watch is running great with lots of amplitude and a low beat error. A new, low profile, PK-style crystal will do a lot to dress up the exterior aesthetics of the watch. A new lizard grain strap completes the overhaul of this now-running watch. I think it turned out gratifyingly well - considering with what I started with. The lug damage could probably be repaired by a jeweler but it's not bad enough to jeopardize the strength of the lugs - so I'll leave it as it. The Martin is a nice, clean looking, no frills design. It doesn't even have any lume to glow in the dark. Did they ever make dials that had dashes on the 1,2 4,5 7,8 10,11 hour marks instead of all arabics? If your question is did Hamilton make a Martin with numerals and dashes then the answer is no. Hamilton did make other similar models with markers and numerals (at 12, 3, 6 and 9) - plenty of them.